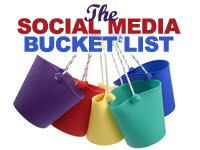 A while ago, I wrote a well-received piece called "The Bucket List" - cataloging my efforts at reducing the myriad of social media sites, tools and applications into a set of slightly overlapping categories. Since then, I have reviewed Brian Solis' Version 2 Conversation Prism, comparing it to my own categories, my own list of 3-4,000 social media sites and tools, and various other presentations out there. All of this - including my own approach left me somewhat dissatisfied. I feel like we're still mucking things up a bit... mixing a whole lot of stuff together to define this landscape in a manner that unfortunately, clouds the picture of what's really out there. I'm not sure that's avoidable, either! In the past, our categorizations of emerging media, sites and tools were probably somewhat useful to people. However, proliferation, adoption and convergence have created so much overlap in the features, focus and content of these tools it is now hard to differentiate between them - or properly fit them into categories that really mean something. To be honest, it's difficult to make this landscape seem more simple - because it's growing exponentially. However, it might be helpful to start a new dialog that helps people process and understand the tools a bit better and explain how I've shifted my thinking over time. 2. 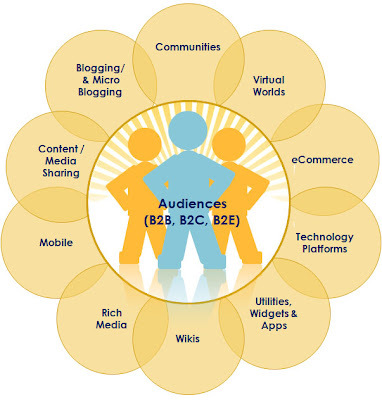 Audience -- The demographic, ethnographic, technographic and psychographics of audiences can also help define the scope, focus and nature of new media. This gets tricky, however, as people converge upon the tools. Consider the changing "face" of the average Facebook user, moving from college student to female in the 40's in just under a year. 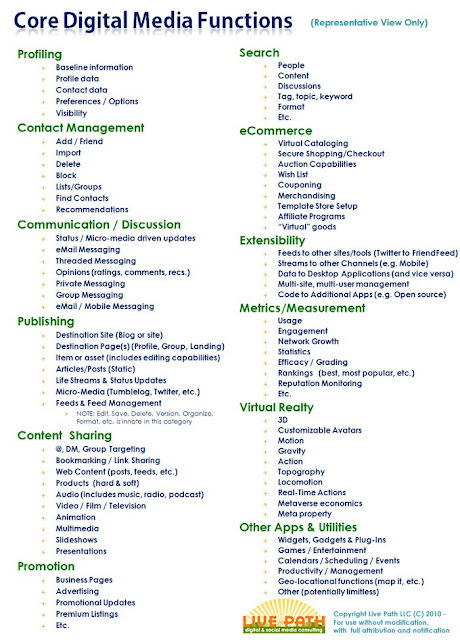 So, when looking at these tools in terms of audience, think of attributes that may remain relatively fixed. For example: Bloggers, Moms, Early Adopters, Christians, Music Lovers. At a base level, this will tell you whether a tool is targeted in a broad or niche market, which is useful for business and personal considerations. 3. Content -- Most sites today accommodate a diverse array of content (news, blog posts, links, pictures, audio, video). However, in some instances, the primary content the supported or featured by the site or tool can help categorize it. For example You Tube is narrowly focused on rich media -- specifically video hosting. Other tools, like Delicious help us organize links and content for retrieval and sharing, in a manner that frees us from desktop-driven bookmarking. Posterous has dual focus: It's a blogging/microblogging tool, and also as a content publishing tool to multiple channels. Next, taking all three areas into consideration, and examining the primary focus of the tool, I then tend to align most sites and tools into one of the following categories. I do this for each category - and some get quite granular. For example, in the Rich Media Category, we find audio, images, video, animation/AR and "mashups" (which do a little of all the above). If you were to drill down further -- into "Video" as a subcategory, you'll find several additional subcategories, including: live video, how-to's, editing tools, converters, sharing, hosting, organization & management, vidcasts and vlogging, mobile video, video search, downloading tools and online TV. So you see, this tends to get highly specific. I will therefore spare you of further detail. In summary, categorizing new media sites, tools and channels may not be the focus of your day -- and at best, it's a hobby for me related to my work with clients as well as speaking and teaching. However, I do think finding ways to better categorize and understand emerging media can be helpful as we attempt to make sense out of the landscape in front of us. This is helpful not just in terms of preserving mental sanity -- but as we attempt to evaluate the usefulness of these tools as applied to our lives, our businesses and/or our clients. As a parting shot -- I'm still figuring this all out, too. If you have any thoughts on this approach, please weigh in. I considered taking this to Power Point/Slideshare - so if you think there's merit in this, let me know! Quick Note: You may notice things look a little different around here. The Experience Architect blog and associated pages are undergoing a migration from Blogger to Word Press. Moving everything over properly to the new platform will take a little longer than anticipated due to client demands and our need to set up redirects to five years worth of content. However, we hope, in the short term, this small face lift improves ease-of-reading and results in a better reader experience in the short-term. Stay tuned for more good things. Do you have any thoughts about what you'd like to see on this site? I'd love to hear them! Feel free to leave a comment or please drop us a line! 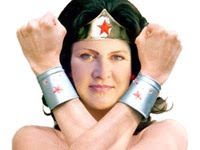 This month I've teamed up with Citrix and Marketingprofs to offer a FREE webinar this Wednesday at 2pm EST called "SMB Superpowers: How to win in 2010." I hope you'll join us as we talk about the shift from traditional to "tradigital" marketing and media. 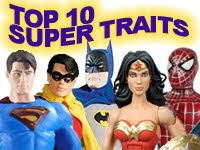 We'll talk about the 10 key characteristics of a Superhero and how to focus in on your strengths, and harness super tools to win in 2010. We'll also cover the one question every one of us should be asking about our customers... and offer a few easy "next steps" to kickoff your Super leaps for the New Year. Moderator and an original Super Heroine in her own right, Ann Handley, hope to see you there! As many of my readers know, I've been working on a super series on how marketers can do more with less in 2010, moving into a more proactive mode and embracing the changes that are occurring in today's marketplace. The third part of this series talks about Power and People. It helps you explore your super capabilities and offers one key question we should ask ourselves to reorient for success in 2010. I was happy to write this piece a guest post on Valeria Maltoni's Conversation Agent Blog. Valeria and I have been blogging co-horts since 2005, and she is also a dear friend. She is one of the sharpest, brightest women I know, with a keen mind for IT and a head for marketing. She is an international speaker and also one of the most prolific bloggers I know -- producing great thought pieces each week, and featuring others, as well -- a great person to follow, so look for her RSS link! Click here to read Part 3 at the Conversation Agent Blog! As I outlined in Part 1 of this series, the planetary shifts and changes in technology, customer behavior, and marketplace dynamics have presented us with magnetic, transformative powers today. As we take hold of these powers, we can become better than we were before - better, stronger and faster. 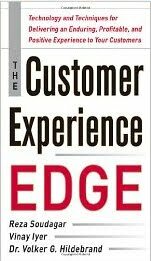 We can transform our companies and reshape customer experience -- perhaps not within a single bound -- but a few well orchestrated ones! As we do this, we can also serve and empower our customers like never before. EMBRACE DUTY & CALLING: Super Heroes possess a sense of duty and calling - and at some point in their journeys, are forced to act upon their calling and/or to use their powers for good. They are called to an unusual life, marked by duty, sacrifice and hard work. In parallel, Super Marketers cannot sit on their laurels within a traditional comfort zone. They must choose to accept the higher calling, stepping out of the crowd to embrace non-traditional principles for success. EXHIBIT SELFLESSNESS: Super Heroes always act in the service and best interest of others. In the same manner, Super Marketers demonstrate an "outside in" focus that stresses the experience of prospects and customers rather than the "inside realities" of the organization. Rather than being overly caught up in the corporate dogma, or the plight of the organization, Super Marketers demonstrate a passion and dedication to champion the needs of customers as the brand's best asset. They embrace the fact that consistently positive customer experience is a key element of positive brand recognition, as well as bottom line performance. They also embrace a servant-leader role within the enterprise, helping facilitate collaboration and cooperation across the corporation. BE BRAVE: Super Heroes do not bury their heads in the sand, but face their fears by assessing challenges head on. In parallel, Super Marketers cannot cringe in the light of a poor economy and the overwhelming onslaught of digital/social channel proliferation. Instead, they must weigh the realities and impacts of next-generation marketing and develop a clear action plan to meet new challenges head on. This includes the need for new interactive and technical skills and core competencies. Super Marketers always respond by taking action with boldness. They understand that failure is an option, doing their best to mitigate risk, learn quickly and improve over time. DEVELOP YOUR SUPER SENSES: Super Heroes gain mastery over their powers through diligence and practice, and often in an "immersive" fashion. In exercising their powers, they often discover new abilities -- or ways to use their existing powers -- in surprisingly useful and advantageous ways. In the same manner, Super Marketers must embrace new skills -- and immerse themselves in new with active testing, use and measured experimentation. The learning cycle (about customers, markets, technologies and best practices) is critical to developing brawn and muscle. Failure is a critical element of success, and should be managed with grace and a determination to succeed the second time around. GET A SIDEKICK (OR TWO): It's hard to go it alone, and that's where a supporting cast fits in. Batman had two sidekicks: Robin, who helped provide on-site supportt, and Alfred Pennyworth, Butler by day and inventor by night, he built the Bat Mobile, utility belts and other gadgets in addition to managing Bat Cave operations. Both sidekicks had important roles to play -- and both saved Batman's bootie on multiple occasions. In the same fashion, Super Marketers need back up, education, information, training, insight, outside services and occasionally -- rescue! Finding ethical, trust worthy, reliable counsel and service from reliable consultants and agencies can be an important ingredient for success. Keep in mind, that Super Heroes are always on-call and assume full ownership of their duties -- they never outsource their responsibilities. In like manner, Super Marketers recognize that while outsourced support plays an important role, it is unwise to become overly reliant on such support. HARNESS "SUPER TOOLS": Whether it's the super vehicle, a utility belt, a golden lasso, or protective cape Super Heroes call upon a host of tricky technologies to help them execute more efficiently and gain a competitive edge over the enemy. These tools help the Super Hero be proactive, and are developed in anticipation of "Super Needs". Super Marketers must carefully examine what's missing from the customer experience, take inventory of the tools at their disposal and use these tools to improve the brand experience for prospects and customers. This is especially true with regard to the many, lower cost, socially driven technologies that can improve response time, communication and dialog, whether it's Twitter for Customer Service, Facebook for lead generation and relationship-building, or YouTube and rich media to stimulate SEO, interaction and education or a tool like Foursquare or other mobile apps. Super Marketers find ways to harness these tools, incorporate them into the plan of attack and weave them into a cohesive experience that helps them drive desired outcomes. DRESS TO IMPRESS: The Super Hero is always appropriately in character. There's always a mask, a costume, a concealed identity and a sense of professionalism. However, while Super Heroes are always personable, they are not always personal. The costume or motif represent brand identity. The entity -- and the actions of the entity -- wearing the costume represent the customer experience (products, services and customer interactions). Super Marketers embrace the importance of brand identity, and the power of personable brand extension, they also understand the importance of developing a unique voice - especially in the era of Social Media. However, beyond "packaging" they understand the only true way to win the regard of the people is through consistently positive, and professional delivery. The costume that oversells what's inside makes the hero seem ridiculous. In the same manner, corporate missteps and wrongdoing tear, soil and shred brand identity. Super Marketers work tirelessly to ensure the branded experience exceeds people's expectations, extending a personable voice and persona in the marketplace that is always professional. RESPOND RAPIDLY & EFFICIENTLY: While answering the urgent call-to-action, Super Heroes rarely "trip over their tights." Demonstrating consistent preparation for the unexpected, they are nimble, agile, forward-thinking, proactive, well rehearsed, and have mastered their skills for maximum response. This is a dramatic contrast to the "reactive" positioning that afflicts many marketing divisions today. Super Marketers are always proactive, scanning the foreground for trends, topics, conversations and issues that either welcome or demand engagement. They act in a manner that elicits maximum response, in accordance with brand, voice and professional conduct standards and established policies. They move quickly to answer market opportunity and respond to challenging situations, turning negatives into positives. BEWARE OF PITFALLS! Every Super Hero has a weakness, or has fallen for a beautiful decoy or deceivingly packaged bomb. For example, Superman knows the sparkle of and magnetic power of kryptonite, which feels like "home" but has a horribly debilitating power. In a similar manner, the rhythmic pattern of task-based focus, rather than strategic focus can be mesmerizing for the Marketer. There are a host of other of operational pitfalls that are easy to get caught in that are unique to each organization and culture. These traps have a neutralizing effect on Super Powers. Super Marketers must work ardently to avoid being trapped by the status quo and be aware of task-based thinking that forces them into a tactical, reactive mode. They must find creative ways to surmount obstacles, bypass pitfalls and deliver value to prospects and customers with steadfast grace. NEUTRALIZE YOUR NEMESES: Super Heroes destroy the terrible, the troublesome and all things evil. Sometimes the enemy is external -- and sometimes Super Heroes battle a dark side, within. Super Marketers are realistic about their own personal challenges as well as organizational issues that may thwart success. They work actively to grow beyond and rise above these problems by crushing ignorance, "inside-out" thinking, poor cross-organizational collaboration, poor integration and addressing leaders who encourage silo-based activities and "one-off" thinking. They work actively with executive leadership to neutralize the enemies of good customer experience, and insist on ownership, customer-focused thinking with an eye to the future and a vision for success. This isn't marketing as we have known it in the past - there are new dynamics at play. Understanding the shifts that have occurred in marketing, and embracing the 10 traits of a Superhero can help drive critical success in 2010. While every organization is unique, it's a good idea to take a mental inventory of the Super Characteristics above, to define what may be missing in your job and/or organization, and develop a plan of attack for making things better. 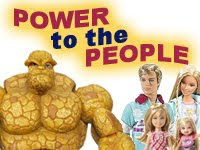 Click here for Part 3: Become a Marketing Superhero in 2010: Power to the People! at the Conversation Agent weblog.